“Joe, i am in the middle of pre algebra with the kids right now so I couldn’t call……BUT LOVE THE RING!!!!!!! It is so beautiful!! it looks great on my hand! I will have to take a pic and send it to you! Anywhere I can write a review for your store? I am so happy and glad I pursued you with a follow up phone call!!! Love the earrings too! 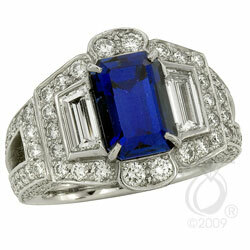 Not sure about the sapphire..I probably should have gotten it bigger, but that is ok…it is an occasional ring. I am sure without a doubt that this ring on my finger will received many compliments!! I can’t wait to show it off! Maybe it will bring me good luck in Vegas!!! If I hit it big, I will let you know! An updated version of our style 7500 with diamonds going completely underneath the center stone! A beautifully matched suite of cushion cut diamonds weighing just under 6 carats total with color between D – G and clarity VVS1-VS2. Bracelet anyone??? Added features of the Valina Bridal Collection include the use of special Euro shanks which allow the rings to have their own distinctive look while keeping them from spinning on the finger. 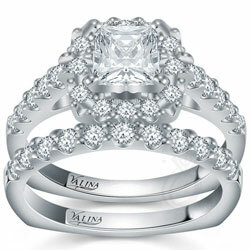 Additionally, all engagement rings have a matching wedding band, both containing the signature diamonds. 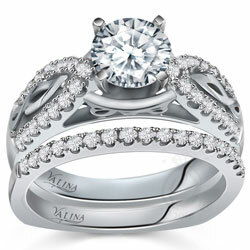 Valina designer engagement ring with .49ct total weight pave set natural diamond accents (setting only, does not include center stone). Shown with a 3/4ct center stone. Matching band available separately. 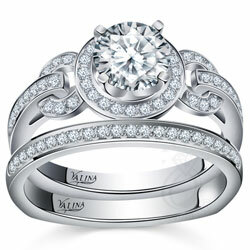 Valina designer engagement ring with .22ct total weight pave set natural diamond accents (setting only, does not include center stone). Shown with a 1ct center stone. Matching band available separately. Valina designer engagement ring with .28ct total weight pave’ set natural diamond accents (setting only, does not include center stone). Shown with a 1ct center stone. Matching band available separately. I stumbled across this video last night and found it quite pleasure. In the same genre of the Ugliest Engagement Rings Ever, one of our favorite posts, this video artfully displays some of the ugliest jewelry ever – and to music! Bring sunlight indoors. Of course, this could mean improving the lighting inside your home but it could also be as simple as wearing a bright and celebratory piece of jewelry. 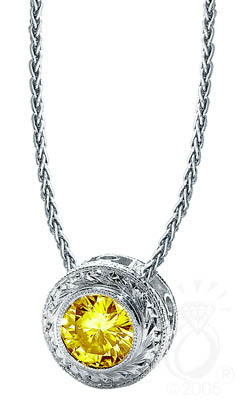 Hand engraved pendant with hand applied scrolls and a 3/4ct Gemesis cultured diamond with fancy yellow or orange color on an 18″ wheat chain. Pendant measures approx. 8mm in diameter. An original design by Joe Schubach. 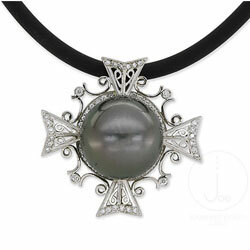 This solid 14kt white gold hand made, hand fabricated pendant features a 15mm natural gray Tahitian pearl along with 1/3ct total weight pave and bezel set natural diamonds. The piece hangs from a 16″ black rubber cord with a 14kt white gold clasp. Internet Special: Save 30% now, In stock and ready to ship! We’ve recently added a few more items to our Specialty Items category. This category contains items that are a little more unusual than what’s on the rest of our site. You’ll find one of a kind pieces, items that are available as custom orders, special deals that we run across and other interesting items that we think you’ll like. Some of these items are available for immediate purchase. Others can be used as examples or as a jumping off point for making your idea come to life! As usual, these items can be made using any metal and stone combination and can incorporate your own ideas. Here are a few recently added pieces. 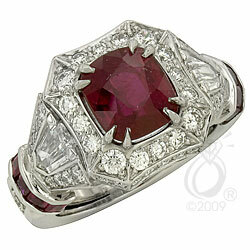 The sapphire pieces and the ruby piece have gorgeous, natural gemstones. They are some of the finest gemstones we’ve seen. The settings are all one of a kind and hand made. 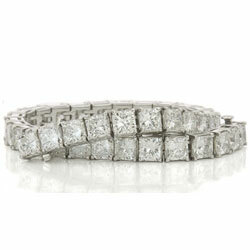 The diamond tennis bracelets are also gorgeous with very nice, well proportioned matching diamonds. All of these items are in stock and ready to ship.